This CellML model runs in OpenCell to replicate the published results (figure 3a). It was curated with help from the equivalent SBML model from the BioModels database (BIOMD0000000236). ABSTRACT: We have constructed a model of the upper part of the glycolysis in the pancreatic beta-cell. 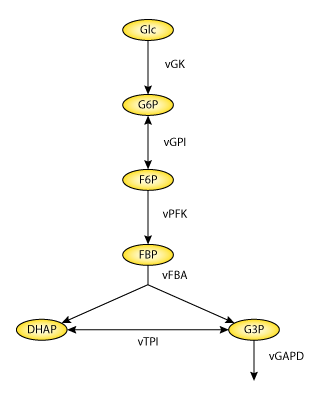 The model comprises the enzymatic reactions from glucokinase to glyceraldehyde-3-phosphate dehydrogenase (GAPDH). Our results show, for a substantial part of the parameter space, an oscillatory behavior of the glycolysis for a large range of glucose concentrations. We show how the occurrence of oscillations depends on glucokinase, aldolase and/or GAPDH activities, and how the oscillation period depends on the phosphofructokinase activity. We propose that the ratio of glucokinase and aldolase and/or GAPDH activities are adequate as characteristics of the glucose responsiveness, rather than only the glucokinase activity. We also propose that the rapid equilibrium between different oligomeric forms of phosphofructokinase may reduce the oscillation period sensitivity to phosphofructokinase activity. Methodologically, we show that a satisfying description of phosphofructokinase kinetics can be achieved using the irreversible Hill equation with allosteric modifiers. We emphasize the use of parameter ranges rather than fixed values, and the use of operationally well-defined parameters in order for this methodology to be feasible. The theoretical results presented in this study apply to the study of insulin secretion mechanisms, since glycolytic oscillations have been proposed as a cause of oscillations in the ATP/ADP ratio which is linked to insulin secretion. Schematic representation of the mathematical model of glycolysis. The fluxes over the enzyme catalysed reactions are denoted v.
Derived from workspace Westermark, Lansner, 2003 at changeset d4c9789e6c65.